On Friday last week I was told I would be on snow watch by my news editor. He rang me while I was at university and said wear your thermals tomorrow Asha you’re being sent out. I ended up in Buckinghamshire on Saturday night at a gritting station, doing a 3-minute live on the chaos expected to hit Britain with flakes falling on cue. As a seasoned outdoor reporter I was layered up to the nines so I was relatively warm. But if you’re forced to stand outside for a long period of time, sometimes the only thing that warms you up once you get home is a hot bath and a cup of tea. Some species of monkey have no problem coping with icy conditions. The snow monkeys of Japan, or Japanese macaques (Macaca fuscata) are one such primate. They can be found in Joshin-Etsu Kogen National Park, Nagano, in a thermal valley known as Jigokudani (“Hell’s Valley”) because of the boiling water that spurts out of the frozen ground and its steep cliffs and dense forests. Snow covers the ground here for four months of the year and temperatures often fall to -20 °C. 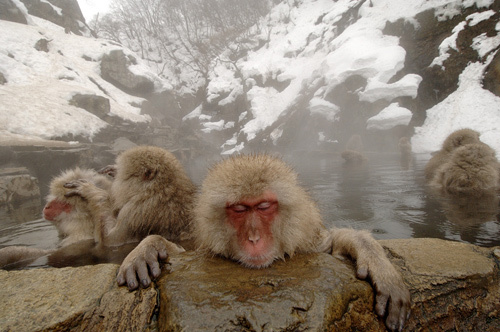 And it’s due to these thermal baths that these monkeys can survive in such harsh conditions. They even drink the hot water! All of the images you see are by the wildlife photographer Heather Angel. The Northerner bought me her book for my birthday. I love the way the infants all look as though they are sporting fury helmets. Infant snow monkeys, like any primate, enjoy playing with objects. From mid-summer when they are born until snow begins to fall, their most common play objects are sticks and stones. But once there is enough snow, it’s kicked around until hey presto (!) a snowball is formed. These primates are even featured in the country’s folklore. The Buddhist Tendai Sect based their three wise monkeys depicting “see no evil”, “hear no evil” and “speak no evil” on Japanese macaques. In between feeding, bathing and moving around, Japanese macaques spend much time grooming. This keeps their fur in good condition by removing parasites and separating matted fur which allows the skin to ventilate – this is essential in the hot summer months, since the macaques are unable to pant or sweat. Some videos I’ve seen posted on the web leave me feeling a tad uneasy. Tourists are allowed to get incredibly close to these monkeys. Studies have shown when non human primates are in such close proximity to humans, the noise people make and even innocuous actions like taking pictures can impact negatively on the animal’s behaviour and physiology. Their anxiety levels can increase as well as their stress levels. Enforcing stricter guidelines within parks such as these is aspirational, as no doubt it rakes in a lot of money from influx of tourists each year. Here’s a beautiful video filmed a year ago of the snow monkeys by Josh Hittleman which captures them wonderfully. I was in Sth Africa a while ago and saw monkeys standing under a waterfall!!!!!!!!!!! This time though it was the cold water they were afterbecause of the boiling hot weather….Wish I had my camera with me at the time but a unique moment all the same! Hope all is well and mind those Gritters!! Hi Caesar, I leave on March 1st for three months. I am so excited and nervous (in a good way) all at the same time. I doubt I’ll be able to make a Gorilla trek this year. Too expensive especially as I am funding this baby on my own. Watch this space for any picture I take. Living in a place which never sees snow I had to think what a gritting station is. A place where you stand and grind your teeth? After a few minutes I think I have a better idea, so no need to supply an answer! Your comment was so funny David I laughed out loud this morning. More snow to come too this weekend, praying they don’t send me out in the cold again! A monkey joke a friend of mine sent me a while ago – maybe bankers should be at the end??? Any plans for goodbye drink in London before you head of to Africa??.. seeing primates other than in a concrete jungle in the middle of London/Chester zoo etc is an ambition I aim to fulfill…Please post pics as soon as you can when you get there!! In the mean time I’ll see if I can arrange a whip round from my rich (???) friends towards your costs!!!!!! Eight monkeys in a room. In the middle of the room is a ladder, leading to a bunch of bananas hanging from a hook on the ceiling. And that is how most companies’ policies get established.!!!!!!!!!! Scary scenario! I’ve been doing a far bit or drinking the last 3 weeks trying to see as many mates as possible before I leave. The tee-total three months will do my liver a world of good. Have a rotten head today.